A vibrating string produces a sound wave as illustrated in Figure 2, Figure 3, and Figure 4. As the string oscillates back and forth, it transfers energy to the air, mostly as thermal energy created by turbulence. 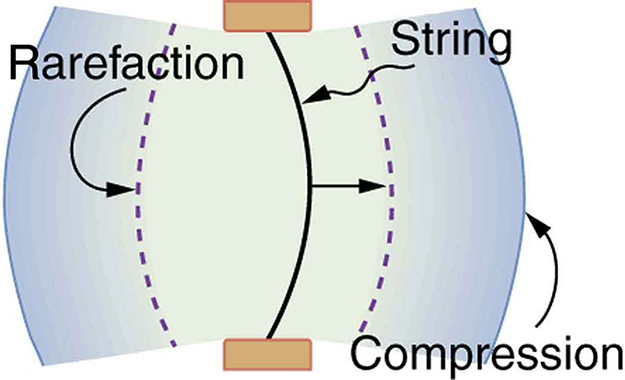 But a small part of the string’s energy goes into compressing and expanding the surrounding air, creating slightly higher and lower local pressures. These compressions (high pressure regions) and rarefactions (low pressure regions) move out as longitudinal pressure waves having the same frequency as the string—they are the disturbance that is a sound wave. 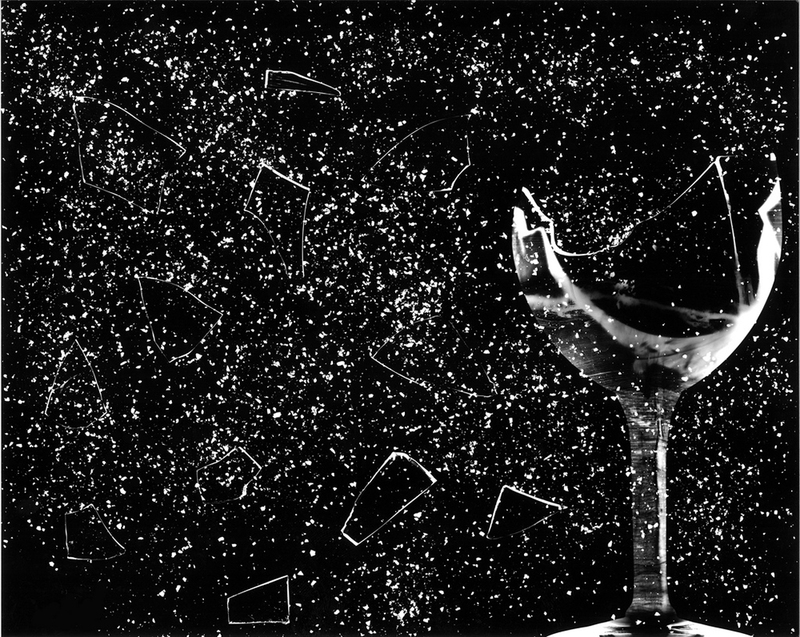 (Sound waves in air and most fluids are longitudinal, because fluids have almost no shear strength. In solids, sound waves can be both transverse and longitudinal.) Figure 4 shows a graph of gauge pressure versus distance from the vibrating string. Figure 2. 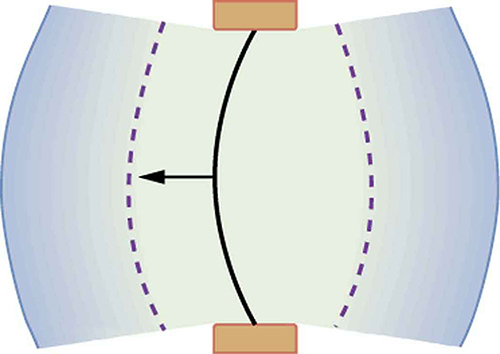 A vibrating string moving to the right compresses the air in front of it and expands the air behind it. Figure 3. As the string moves to the left, it creates another compression and rarefaction as the ones on the right move away from the string. Figure 4. After many vibrations, there are a series of compressions and rarefactions moving out from the string as a sound wave. The graph shows gauge pressure versus distance from the source. Pressures vary only slightly from atmospheric for ordinary sounds. The amplitude of a sound wave decreases with distance from its source, because the energy of the wave is spread over a larger and larger area. But it is also absorbed by objects, such as the eardrum in Figure 5, and converted to thermal energy by the viscosity of air. In addition, during each compression a little heat transfers to the air and during each rarefaction even less heat transfers from the air, so that the heat transfer reduces the organized disturbance into random thermal motions. (These processes can be viewed as a manifestation of the second law of thermodynamics presented in Chapter 15.3 Introduction to the Second Law of Thermodynamics: Heat Engines and Their Efficiency.) Whether the heat transfer from compression to rarefaction is significant depends on how far apart they are—that is, it depends on wavelength. 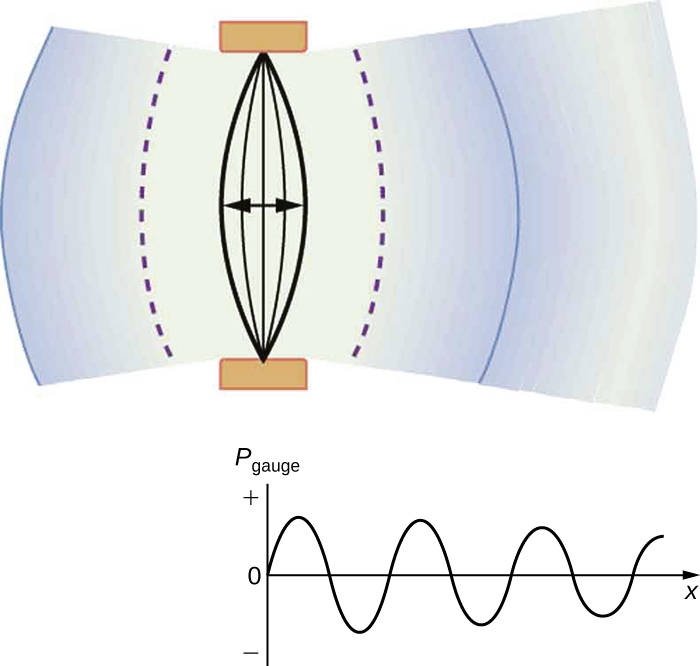 Wavelength, frequency, amplitude, and speed of propagation are important for sound, as they are for all waves. Figure 5. 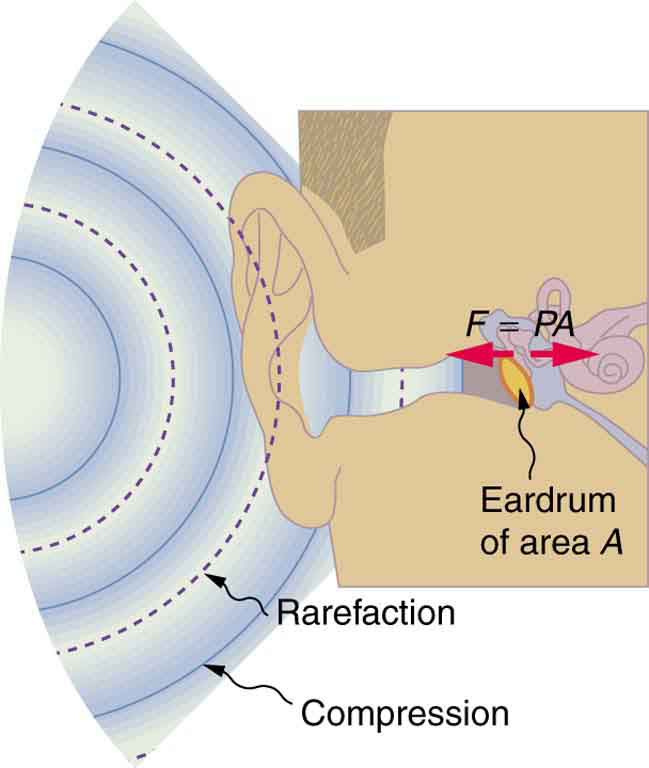 Sound wave compressions and rarefactions travel up the ear canal and force the eardrum to vibrate. There is a net force on the eardrum, since the sound wave pressures differ from the atmospheric pressure found behind the eardrum. A complicated mechanism converts the vibrations to nerve impulses, which are perceived by the person. 17.1 Sound by OpenStax is licensed under a Creative Commons Attribution 4.0 International License, except where otherwise noted.